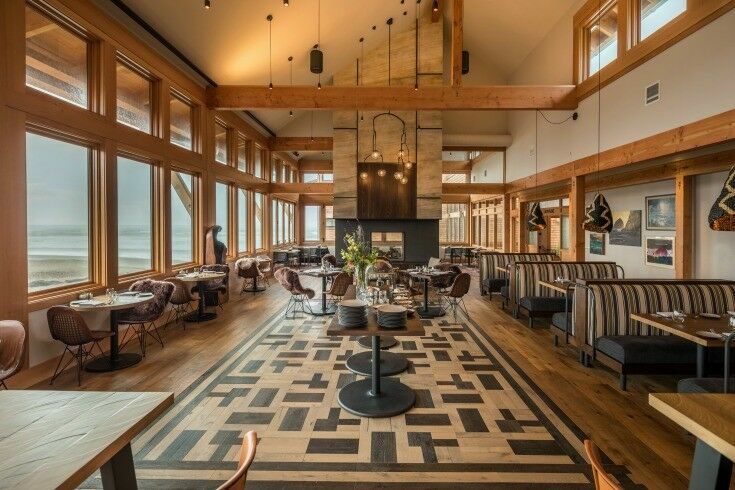 If you’re craving some delicious, locally-sourced ocean-to-table cuisine, prepared with care and served up with a panoramic view of the Pacific Ocean, then head to Meridian at Headlands Coastal Lodge in Pacific City, Oregon. 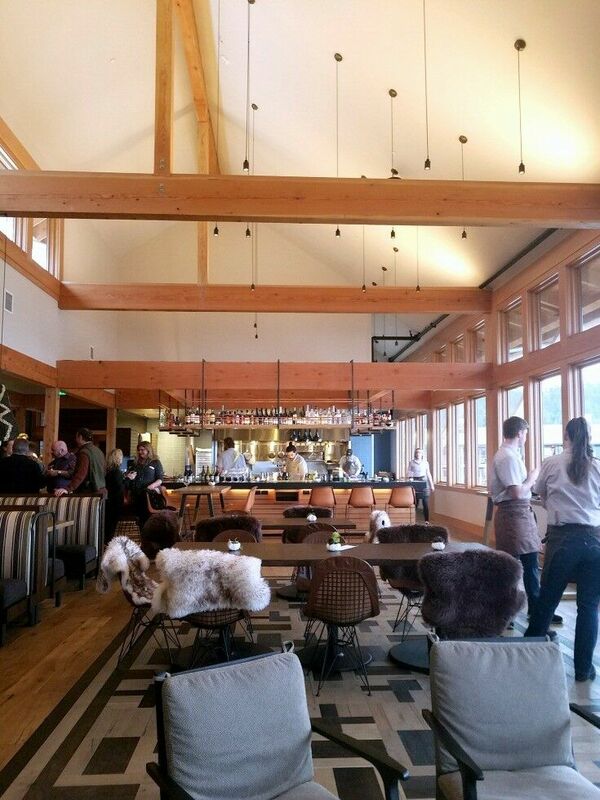 Many thanks to the Headlands Coastal Lodge & Spa for hosting our stay and for providing our complimentary brunch. This post may contain affiliate links. 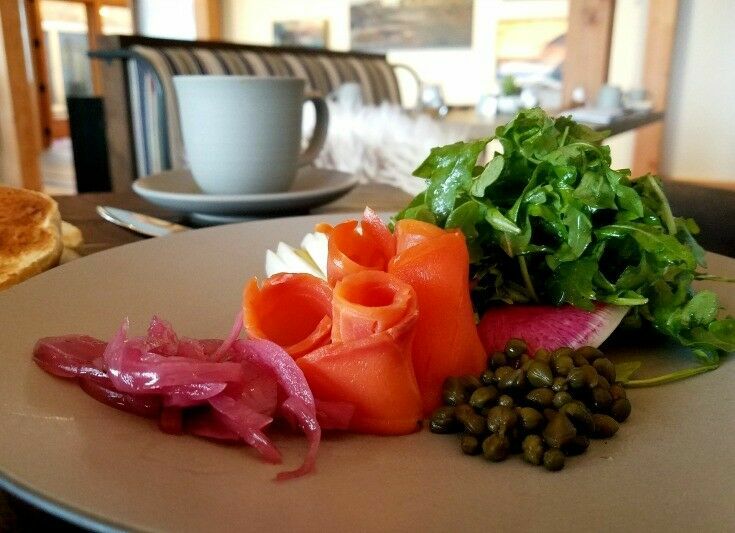 Before I get started, let’s just take a moment to appreciate this beautiful plate of lox that Mr B had for brunch at Meridian when we stayed at Headlands Coastal Lodge & Spa last month. OK, now that we’ve gotten that out of the way, let me tell you a little about Meridian. When you walk into Meridian at Headlands Coastal Lodge, one of the first things that impresses is the natural beauty of the space. Exposed beams frame the vaulted ceiling, Oregon hardwoods cover the floors, and light streams in from the sky-high windows that open to a panoramic ocean view on two sides of the dining room. Meridian’s seating options include window-side tables with gorgeous views of the Pacific and cozy tables by the double-sided glass fireplace. At the far end of the dining room, a lovely indoor patio lounge overlooks the ocean, with accordion-style windows that open completely when warmer weather blows in. 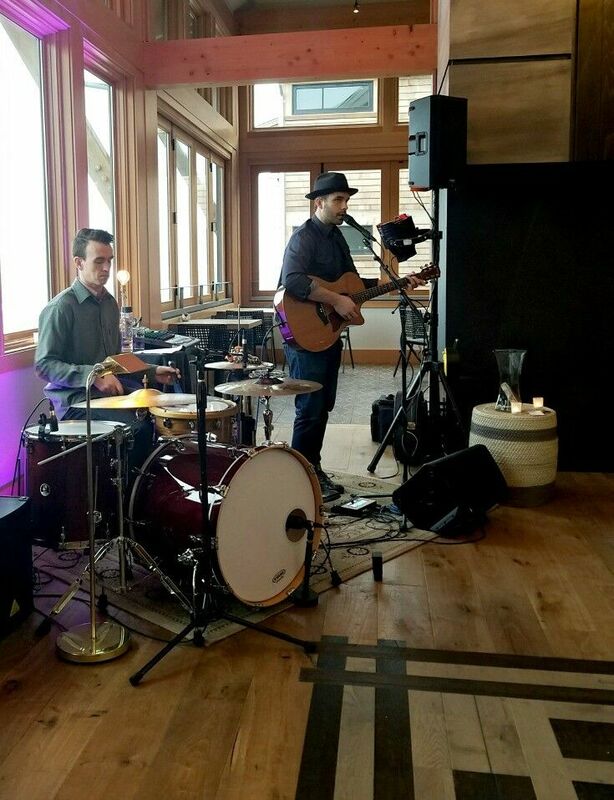 In the evening, and particularly on weekends, you can often enjoy live music at Meridian. The night we were there, Kevin Welsh and Lucas Cook of Satellite Blooms kept us well-entertained with both with their original “soul-folk” tunes and solid covers of everyone from Cash to Cole to Radiohead. 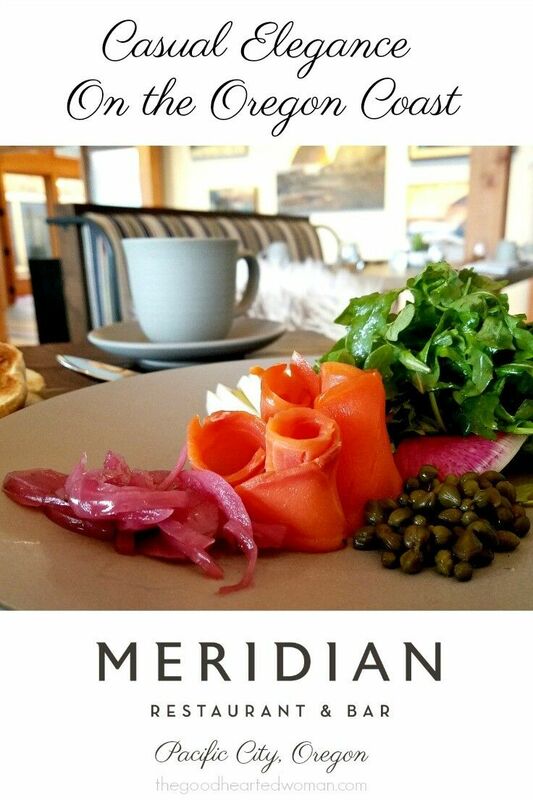 During our stay at Headlands Coastal Lodge, Mr B and I had the opportunity to talk with Meridian’s Executive Chef Andrew Garrison, who shared with us his passion for connecting with local sources to provide the freshest ingredients he can find. From wild caught fish to locally farmed meats to forest-foraged greens, Chef Andrew and his culinary team proudly partner with Oregon and Pacific NW producers, growers and artisans to create a menu that joyfully celebrates the region’s bounty. 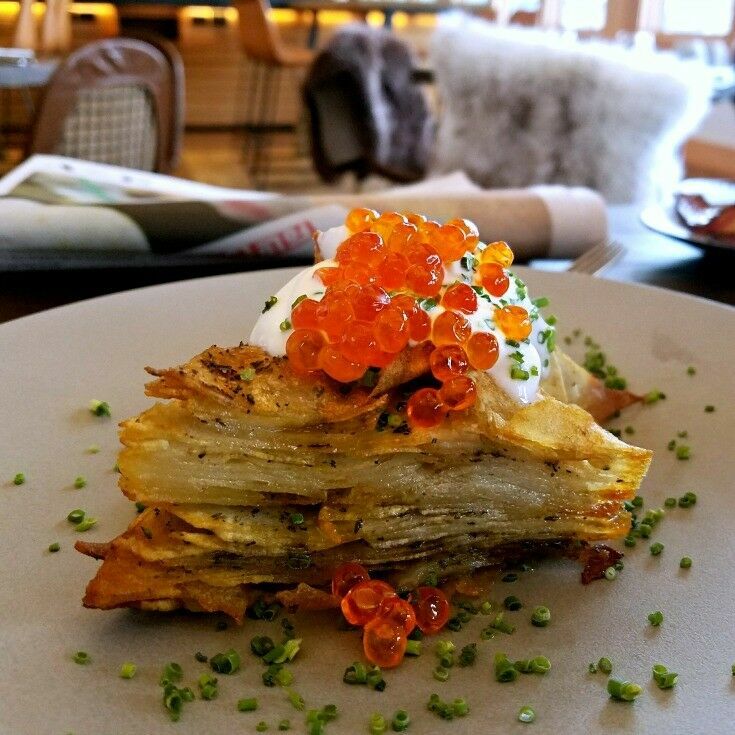 Potato stack with crème fraiche and salmon roe. As I mentioned at the top of the post, Mr B and I enjoyed a wonderful brunch at Meridian. Our server was attentive, knowledgable, and friendly, and she gave us good insights about our menu selections. Our food arrived promptly, fresh and beautifully plated. We found the actual number of items on the menu somewhat limited (there were only about six or seven main choices on the brunch menu) but the quality of the dishes offered more than made up for any shortage of choices. 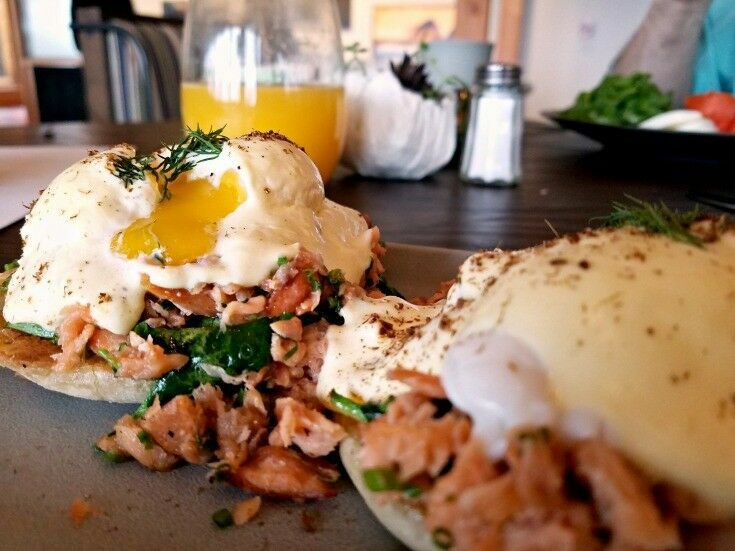 We did not go hungry by any stretch, and I highly recommend both the lox and the Benedict. 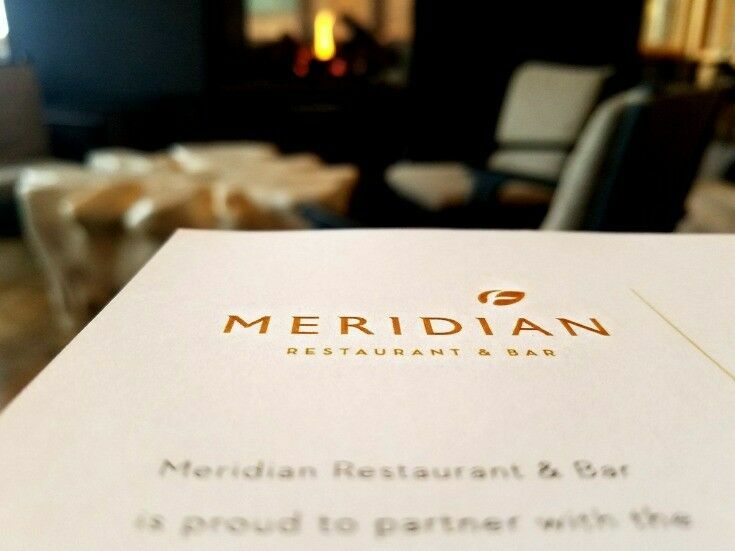 Note that while reservations are not required, they will will help the Meridian staff prepare your table and service for your upcoming visit. Also, if you have a special occasion coming up, they will make sure you have an ocean view, serve a private meal in one of the lodge dining rooms, or cater your outdoor gathering right on the beach. 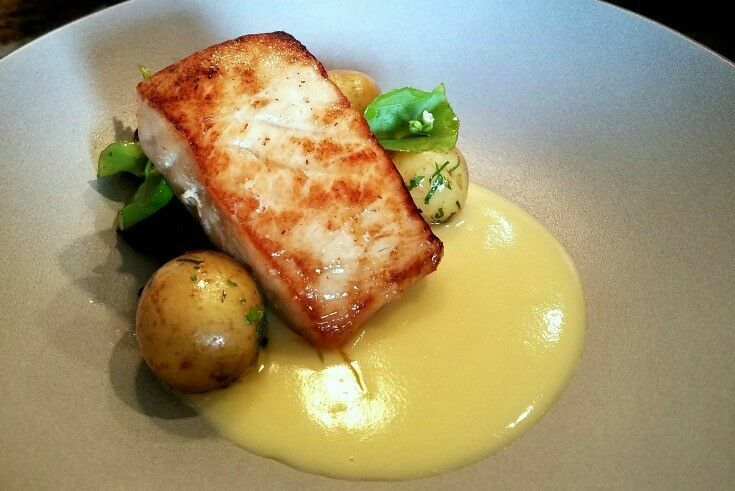 Coming up next time: Meridian’s Executive Chef Andrew Garrison shares his tricks and techniques for making seared sturgeon! 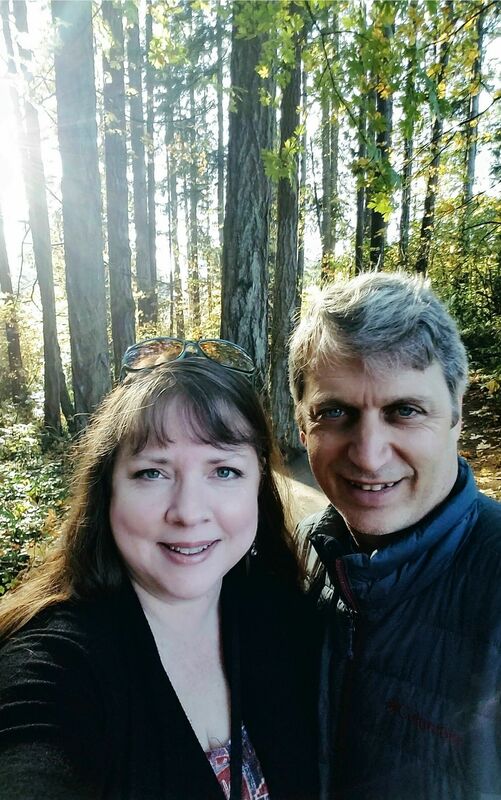 Disclosure: Our thanks to the Headlands Coastal Lodge & Spa for hosting our stay and for providing our complimentary brunch at Meridian. As always, all opinions and photos (except as noted) are our own. This post may contain affiliate links, which means we may receive a commission if you click a link and purchase something that we have recommended. While clicking these links won’t cost you any extra money, they will help us keep this site up and running. Please check out our disclosure policy for more details. Thank you for your support! The Headlands turned out just beautiful! I love that we have a new place to eat right up the road from our beach house in Cloverdale now! Their cocktail program is on point too! We’ll be heading there tonight! Oh wow, what a beautiful place to dine! All the food looks delicious too. If I’m ever in this area, I’ll go! This place looks absolutely lovely! The hubs and I are looking for some new places at the beach for a no-kids getaway and we might check this one out! It’s a really beautiful facility. The hotel accommodations are luxurious without being ostentatious, and the food at the restaurant is totally worth the trip. That looks like a beautiful place. Apart from the place, your hotel looks mazing too. Food looks so amazing. Looks like a lovely place to have a meal. Great for Mothers Day!! They are serving a special Mother’s Day brunch this year! Wow what a beautiful looking restaurant, I love that they have live music and that food just wow! I would so love to stop here for some food. Talk about awesome food and a good place to enjoy it. This is definitely a restaurant that I wouldn’t mind dining at. I think it’s beautiful! I love the way this restaurant looks. And the food, yum yum, seems so fresh and delish. It’s perfect for a date or a celebration. Meridian is just so beautiful. I love its interior decor and well, I can just imagine how much more beautiful its outdoor is; now that it provides a nice view of the sea. Anyway, the meals also look scrumptious! And a talk with Chef Andrew seems very awesome. This place looks absolutely great. The pics are so attractive and mouthwatering. What a cool spot. That food looks too good to eat. Like art on a plate. Looks like a great place to enjoy a meal. I love all the pics you’ve shared in the post. I am looking forward to reading Meridian’s Executive Chef’s tips and tricks! Wow this restaurant’s interior is so beautiful and I love the large windows with a view. I need to visit Oregon! Wow this restaurant looks incredible. I will have to check it out if I am ever in the area! That looks like a beautiful place and an amazing restaurant. I’m not sure if my taste buds are adventurous for some of that seafood, but it looks yummy! Omg wow the restaurant looks incredible from that gorgeous panoramic views to the live music and food. 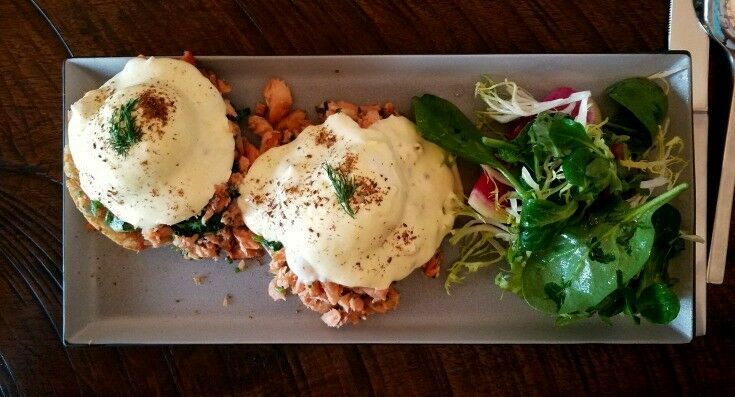 But that food though….looks so good. I love a good benedict. I’ve always wanted to visit Oregon and this looks like such an awesome place to visit! And what incredible food too!